The Franklin Historical Museum is launching a new speaker series to be held the second Sunday of each month starting in February. Speakers, on a wide range of historical topics, will give presentations that will run from 60-90 minutes. Each presentation will begin at 1:15 PM. "We're excited about his new speaker program and hope it becomes something the community will look forward to, depend on, and enjoy", says Historical Commission member Mary Olsson. "We just started booking speakers last month, and although not all dates are full at this time, we have a strong line up at this point." February 11 : Paul Compton – "Saving Franklin's Historic Homes from the Wrecking Ball"
- Compton, a long time resident, engineered the relocation of 5 houses from the last 1960s to the 1990s. At least one of those homes dated back to the 1840s. The homes, now located on Pond Street were in the way of 'progress'. Compton illustrates his motivation, enterprise, and technique in saving these home from the wrecking ball. March 11 : Alan Earles – "The Blizzard of '78"
- Local historian and writer Earls takes a look back at the impact of the storm and the memories it evokes to this day. April 8: Joe Landry – "Notable Women in Franklin's History"
- A museum favorite returns with a presentation on some of Franklin's most famous and historical figures in Franklin's past. May 13 : James Johnston – "The Oliver Pond House in Context"
- Franklin Historian and author, Johnston is a descendent of the Pond family, an original founding family of Franklin. Johnston has been the owner and caretaker of the museum-like historical home for the past several decades. This timely presentation on the Oliver Pond home is sure to be entertaining. June, July and August: special guest speakers to coincide with the annual summer Bridal Gown Exhibit. Details to follow. October 14: Mike Tougias – "King Philip's War"
- NY Times bestselling author Michael Tougias will give a slide presentation on the war between the Colonists and Native Americans in 1675-76. Tougias is the author of the acclaimed Until I Have No Country (A novel of King Philip's War), and co-author with Eric Schultz of King Philip's War: The History and Legacy of America's Forgotten Conflict. November 11: Alan Earls - "Monuments (part II)"
– The story of the war memorials on Franklin Common. A follow-up to the interesting presentation last fall, historian Earls reveals the story behind the story of our town's war memorials. 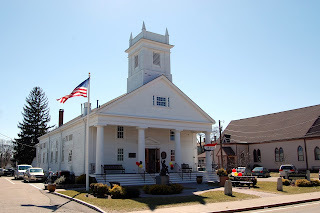 In addition, the museum has an aggressive event schedule planned starting with hosting the Cultural Connections Roundtable event on February 1; the celebration of the Town's 240th Birthday on March 3; and the participation in the state-wide cultural ART WEEK with five scheduled events and exhibits. A full year of events is scheduled. Follow us on Facebook for timely updates. The museum is located at 80 West Central Street, is wheelchair accessible and entry is always free.